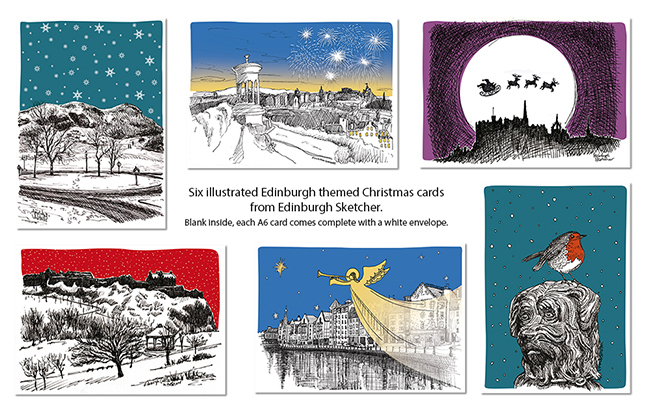 Although not quite November I would like to share with you my pack of six illustrated Christmas cards of Edinburgh scenes. Christmas is fast approaching so now is the time to order your cards to send. The pack of six designs have a recommended retail price of £9.50. Left blank inside for you to add your message, each A6 card comes complete with a white envelope. The Christmas card pack is available to buy online from today for the price of £9.50 each, with no postage and packaging to pay. Simply visit my Etsy shop HERE to order. Alternatively you can buy the cards in person at Cafe Musa on the Mound and I will continue to add more shop details as I get them.